Should We Start a Solar Panel Trade War with China? Heavily subsidized land and loans for an exporter like Sunzone are the rule, not the exception, for clean energy businesses in Changsha and across China, Chinese executives said in interviews over the last three months. W.T.O. rules allow countries to subsidize goods and services in their home markets, as long as those subsidies do not discriminate against imports. But the rules prohibit export subsidies, to prevent governments from trying to help their companies gain in world markets. If the country with the subsidies fails to remove them, other countries can retaliate by imposing steep tariffs on imports from that country. 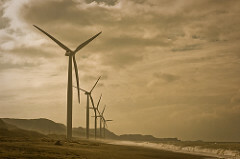 But multinational companies and trade associations in the clean energy business, as in many other industries, have been wary of filing trade cases, fearing Chinese officials’ reputation for retaliating against joint ventures in their country and potentially denying market access to any company that takes sides against China. There's a trade-off here. China's policies are helping to bring down the coast of wind and solar—as the Times notes: "Solar panel prices have dropped by nearly half in the last two years, and wind turbine prices have fallen by a quarter." But U.S. companies are suffering as a result: BP just shut down a solar manufacturer in Maryland while expanding its Chinese operations; another company, Evergreen Solar, is closing its 300-worker plant in Massachusetts and hightailing it over to China. So how should the United States respond? One possibility would be to retaliate and set up new trade barriers. But that runs the risk of making various renewable technologies more expensive, which would only deepen the world's reliance on cheaper and dirtier energy sources like coal. The U.S. government could also try to match China by speeding up financing for its own domestic industries. The stimulus bill contained some $59 billion in grants, loan guarantees, and other incentives for new clean-energy industries. Trouble is, the Energy Department has been relatively sluggish in handing out this money—ironically, there seems to be less red tape in China for clean-energy financing (my impression from talking to government officials in China was that they're a lot less concerned about the occasional bad loan than they were about speed and scale; the Obama administration, by contrast, is obviously worried about bad press from shoddy contract and corruption). Of course, this state of affairs isn’t guaranteed to last forever. The MINES ParisTech study looks at 2008 data; things have probably tilted in China’s direction since then, and they may continue to do so, particularly given unfair trade policies from China. But the lesson remains: just because cleantech products don’t get stamped “Made in the USA” in the finishing stages doesn’t mean that the United States can’t win from the clean energy race. That sounds right, caveats and all—and it does seem like a far more effective way to strengthen the U.S. clean-energy industry would be to boost domestic demand (through, say, a renewable-electricity law, although see Dave Roberts's latest post for the dismal prospects of Congress passing one of those) than through a solar-panel trade war.